My mind was still processing the rescue of the previous three hours, so I journeyed to my next assigned location and ambled slowly along the path to Delicate Arch. Sunset was a couple hours away. Visitors were going and coming, happy, hauling cameras and tripods, joking among themselves, pleased to be hiking to the most iconic of Arches’ arches. Inside I was cringing, knowing what a bossy and vocal crowd the sunset photographers are at The Arch. Why does nobody shoot a side view of Delicate? Look at this fat leg of gorgeousness. Arch etiquette is, for the most part, unwritten. 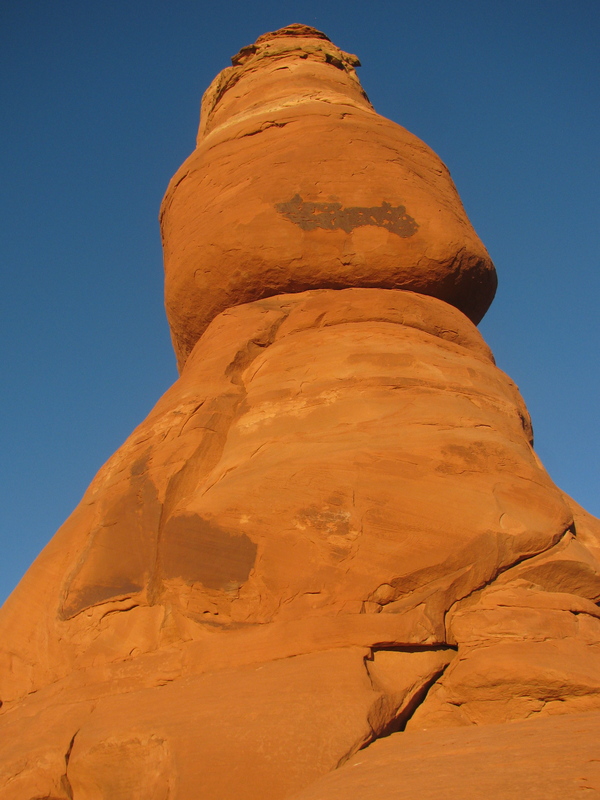 There is one sign at the visitor center that suggests how to avoid being an ‘Arch Hog’ — i.e., occupy any arch space briefly, only for the time it takes to snap a photo, and exit quickly so others can photograph the formation. This common courtesy prevents hostilities from building in frustrated photographers. 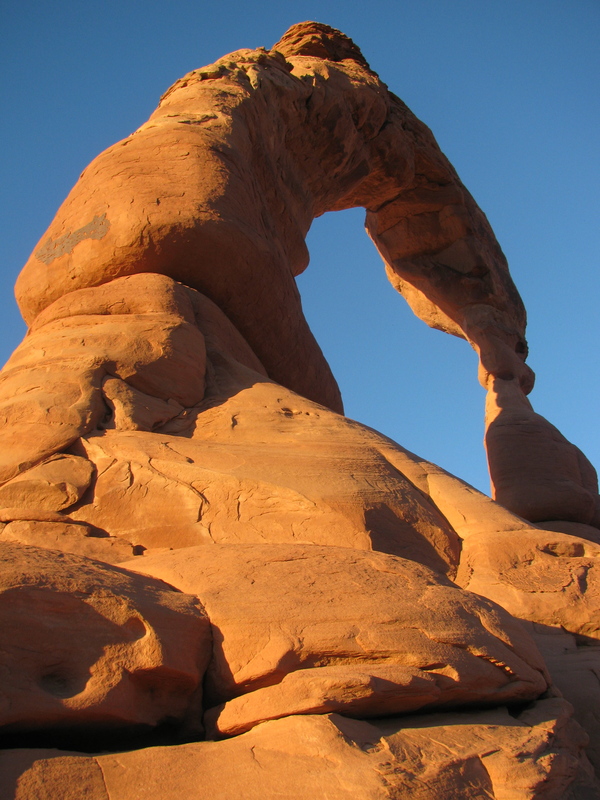 However, the “Me under Delicate Arch” photo is everyone’s goal, and these desires often conflict with the masses’ wishes. I’ve learned to stay away from Delicate at sundown because it is a circus of boorish shutterbugs. With about 120 folks up there, tonight was no different. Even though sunset was still fifteen minutes away, any time an individual began walking toward the base of the arch, thirty or forty people would start booing or whistling. The person got the message and retreated. I realized once again why I love wilderness, which humbles you but never shames you or bosses you around. Hiking down into the bowl beneath the arch, I decided to get shots from angles I’d not tried before. I even got a “back side of the arch” shot (large one above) before the mob became too angry, although my ranger uniform may have provided a modicum of immunity. I’ll find my lovely end-of-day shots elsewhere from now on. Hope you enjoy these. I was in the Visitor Center when a radio transmission came in from the head law enforcement ranger. 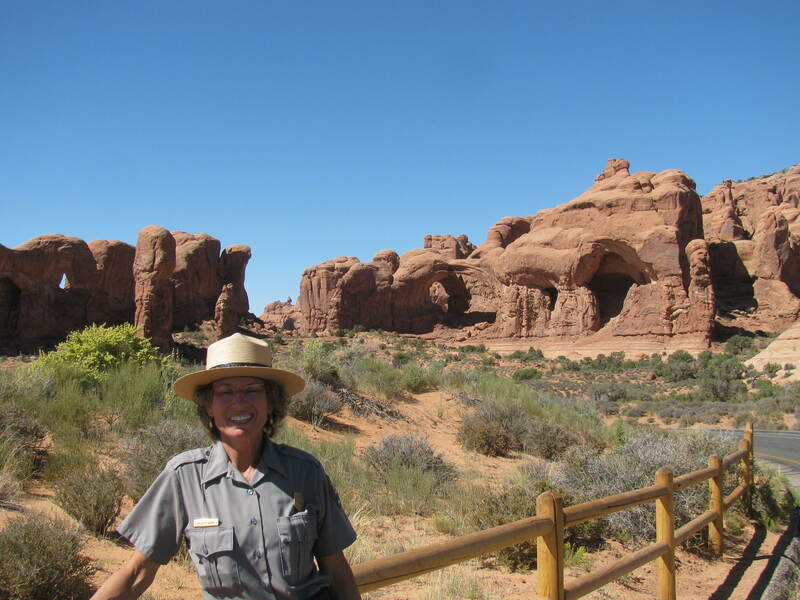 She needed helpers on a litter carry-out from the Fiery Furnace, where a portly 66-year-old man had injured his ankle while on the ranger tour. In the maze-like Furnace, the more helpers the merrier; it’s rough, difficult, challenging terrain that often requires lowering of a litter via ropes over edges. It’s also a labyrinth in which people get lost. 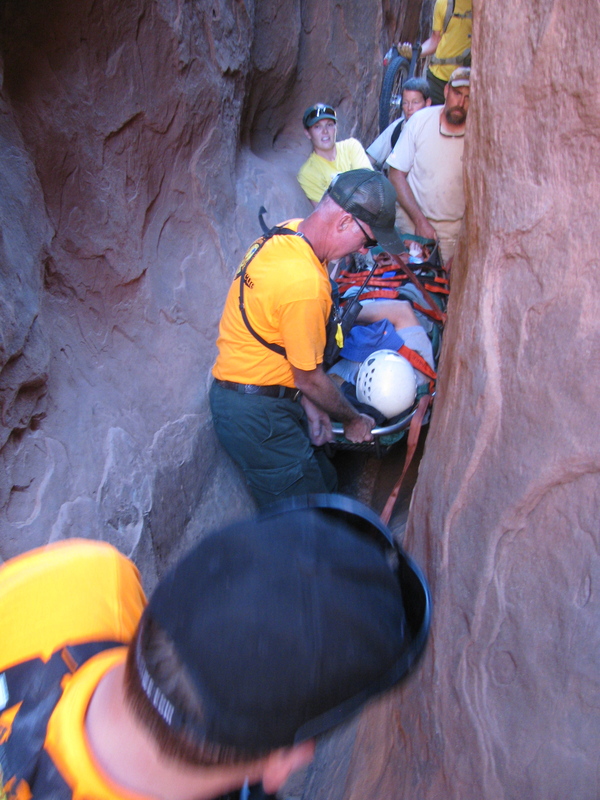 The litter isn’t more than two feet wide at the shoulders, but the patient was located in the most distant area of the route and we’d have to squeeze through several cracks in the Entrada sandstone fins in order to get to him and carry him out. Not overly difficult with a light empty litter; another story entirely with an aging uncomfortable injured man on board. Fifteen (15) park workers took part in this rescue. It took a few hours. The patient wasn’t hurt badly but he could not walk. In thin or bouldery places we had to pass the litter forward with carriers peeling off the back and scurrying to the front to receive the next hand-off. This was not easy. Nor was it easy to carry him through places which had 5-inch widths for feet and about 18 at shoulder height. My mind flashed back fifteen months to my very first day ever in uniform at Arches, when a man fell from Turret Arch and needed a helicopter to pick him up and take him to Colorado to repair his broken femur. 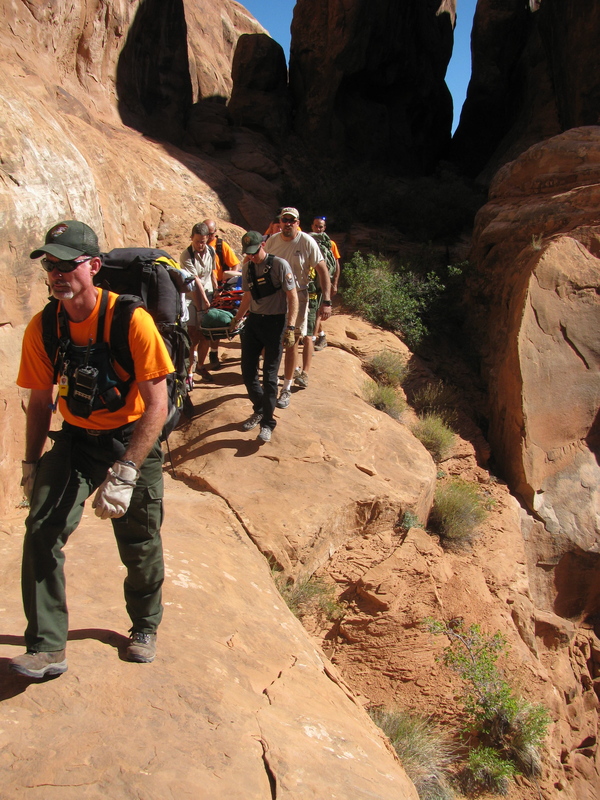 Sunday’s incident was my last day at Arches 2010 — a fitting bookend to my first rescue event. Today is my last shift at Arches National Park. Today is the last time I can announce the 15-minute orientation film, pick Encyclopedia Lee’s brain, and issue permits for the Fiery Furnace. 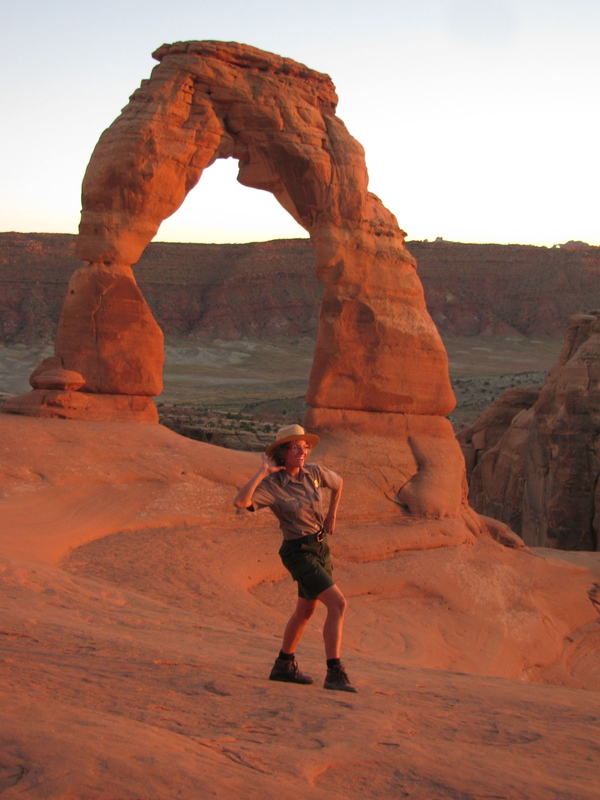 It will also be the last time I hike up to Delicate Arch wearing my beloved green-and-gray park ranger uniform and the coolest hat on earth. Yesterday I did my final hike in Canyonlands NP to Upheaval Dome. 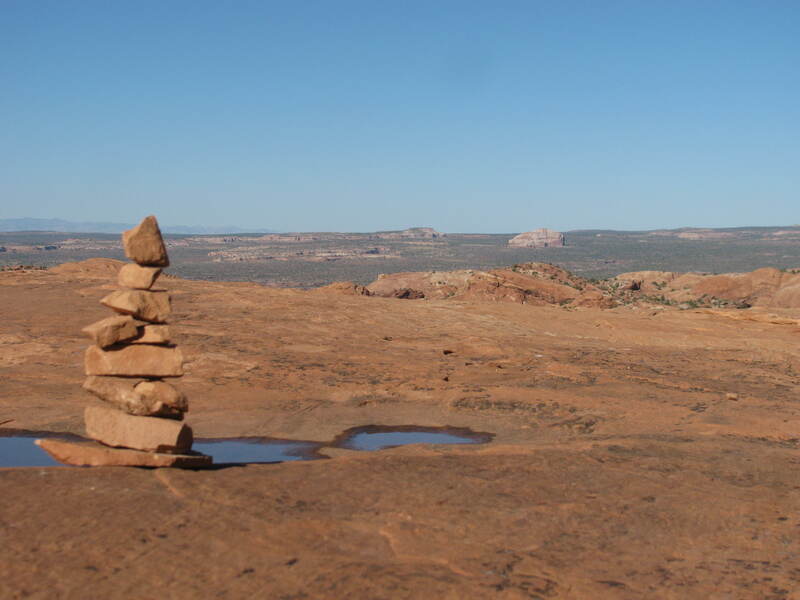 The photograph of the carefully-constructed cairn was taken at the first overlook as I was hit with a wave of fond memories of my many treks up there to interpret this geologic anomaly for visitors. Tomorrow I make my last gorgeous drive up to Island in the Sky for my final two days’ work and a sleep-out on the basketball court. Goodbyes will be wrenching. Deep friendships have been forged in this desert land, and the men and women who have become part of my life are very dear to me. This is a part of park service employment that is difficult for everyone, and each ranger deals with it in his or her own way. Some just don’t let their hearts become attached because of the inevitable pain of the goodbyes; that is not possible for me. I’ll just try to staunch the bleeding, and heed my wise mother’s advice not to mix driving and crying. I found this photo of my dear children as I was scrolling through iPhoto — the last one we took before I came out here in February. It made me tear up and want to gather them all in my arms and hug them and squeeze them and cook with them and laugh with them and relish being in their presence. THIS is what makes leaving bearable, and pulls me eastward. Even though I have become a hopeless ‘desert rat’ through and through, Minnesota is still my home. Friends and family — see you soon. Meanwhile, I need to go polish my boots. There had been a snafu with our government vehicle at a busy arch location. A staff member had locked car keys inside, and I was the one to catch a ride to the general vicinity with the spare set. Because the one giving me the ride was almost late to her guided tour, I had her drop me off 1.5 miles from The Windows as I had time to hike in on a beautiful day. 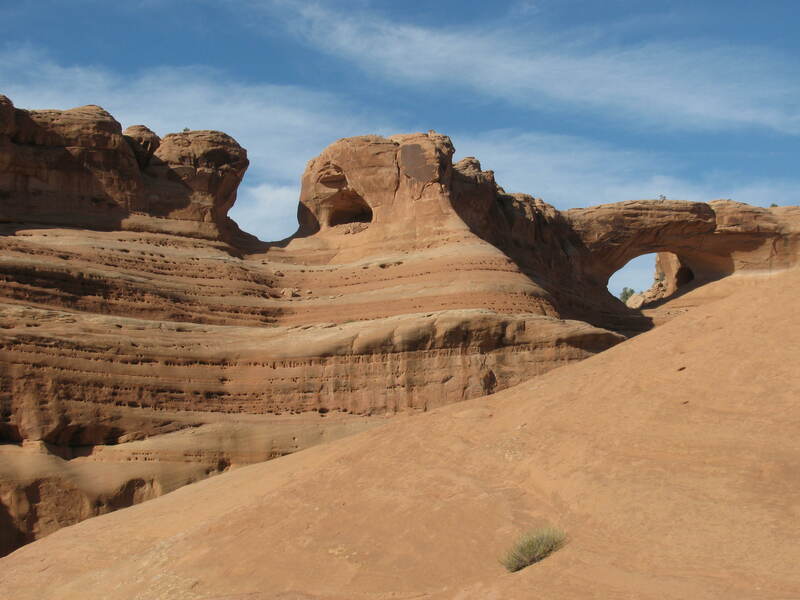 Besides, it would give me a chance to approach this section of the park on foot for the first time and see the large formations without a windshield in the way. 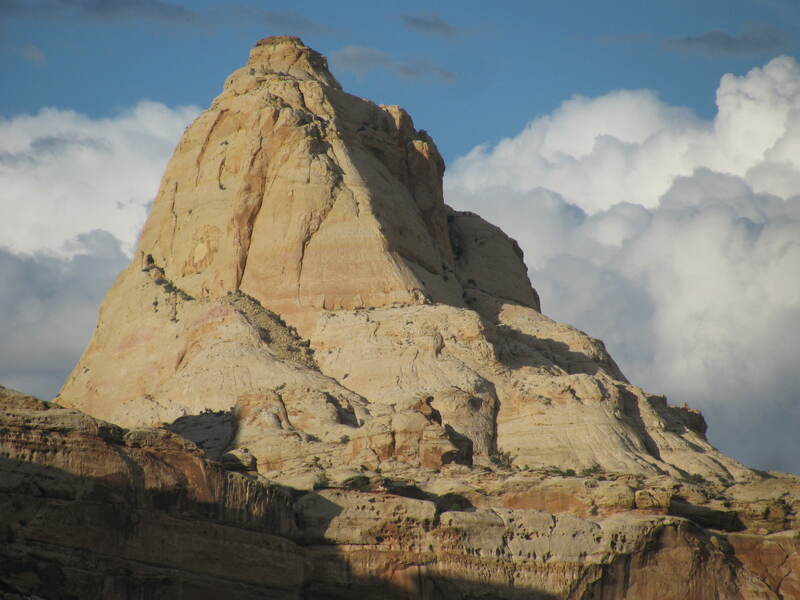 It’s not often that a polygamists’ enclave morphs into a national park, but somewhere between the historic Mormon fruit orchards and the thousand feet of Navajo sandstone and the geologically famous Waterpocket Fold, legislators found Capitol Reef worthy of protection. I am so glad they did, as I went on an Explore on my days off with two co-workers. Risking life and limb on a rainy afternoon in a flash-flood-prone canyon, roasting marshmallows over a camp stove, and facing off against a marauding raccoon in the campsite made it all the more memorable. Always when I go to a place new to me, I am struck by the differences-that-are-similar. 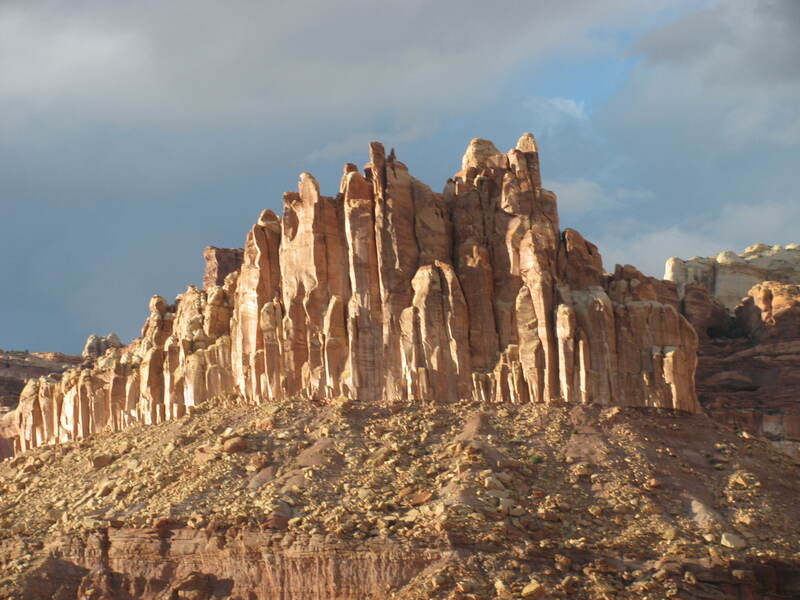 Most of the rock layers in Capitol Reef are also present in either Arches or Canyonlands or both, but they are of different colors and thicknesses farther west. 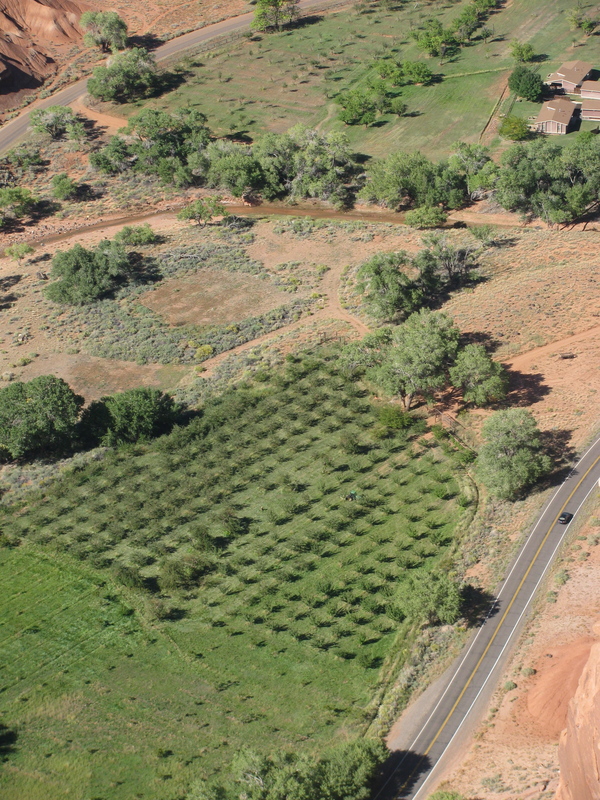 The green oasis that is Moab is watered by the Colorado River, and fruit trees of many types thrive in the Moab Valley; the Fremont River runs right through Capitol Reef, prompting the ancestral people to dig irrigation ditches for their gardens. The early Mormon settlers found these ditches and planted numerous fruit orchards in this oasis. This is the only national park I know of in which visitors can walk through the orchards and pick any fruit that is in season and eat it on the spot. (If you remove fruit from the orchard, you weigh and pay for it on the honor system.) Apples, peaches, pears, plums… whatever your heart desires is yours for the picking, if you can get it before the mule deer do. "The Castle." 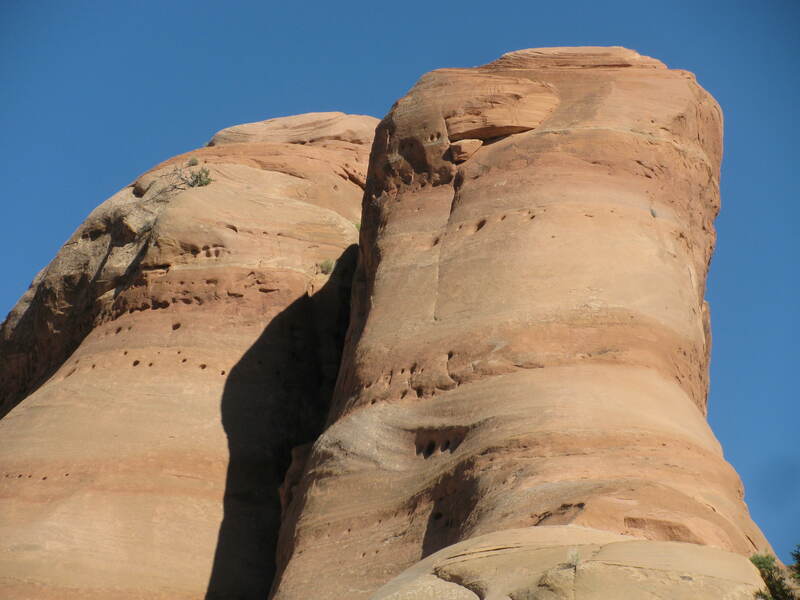 Wingate sandstone is far more pink-and-salmon in Capitol Reef than in Canyonlands. Majestic sandstone monoliths are indescribably beautiful, especially when thunderclouds frame them. Our 1.5 days in the park were woefully inadequate to explore much; the National Weather Service phoned the park to notify them of the high risk of flash floods, which kept us out of some of the exceptionally scenic low areas. We’ll save those for next time. There will be a next time. Those Mormons sure know how to make hot-from-the-oven pies worth driving hours to get. I couldn’t believe my eyes. Standing at the trailhead where the hikes range from 1.6 miles to 7.2 miles in length, I watched a middle-aged couple head from the parking area onto the gravel trail access. Actually, I hardly saw HIM, because SHE was far too fascinating. Of course her footwear caught my eye. Who in their right mind wears four-inch heels for hiking?!?! The denim mini-skirt, off-the-shoulders white top, designer sunglasses, jewelry, and perfectly-coifed hairdo completed the look. 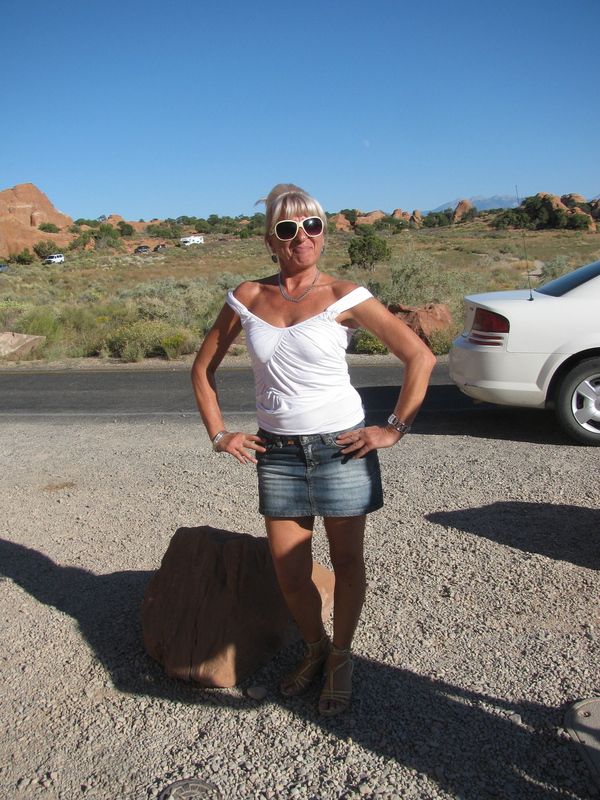 This is NOT your typical Arches NP outfit. I nearly asked her if I could take her photograph, but restrained myself. Over the next thirty minutes or so I was discussing lizards animatedly with visitors who stopped at my table, but I couldn’t get her out of my mind. I kept hoping she’d give up on the high-heel hike and return, because now I was quite certain that I would stop at nothing to get her picture. Alas. It was not to be. Note SHADOW of heels. They definitely are 4". My shift was over and I ambled to my car with all my lizardly goods. It would be a 40-minute drive back to the visitor center, time to wind down and process my day. As I pulled out, past the trailhead, THEY APPEARED. Jumping out of my car, I walked quickly to them and greeted them. They spoke not a word of English, so I managed to convey my need for a photo because of her great beauty. “Italiana!” she laughed. “Italiana bellissima,” I replied, and THAT got me my photo. According to other hikers who passed her on the trail (smiling and shaking their heads), she had to keep stopping to empty the sand from her sandals. Gotta love those Italians. Totally. 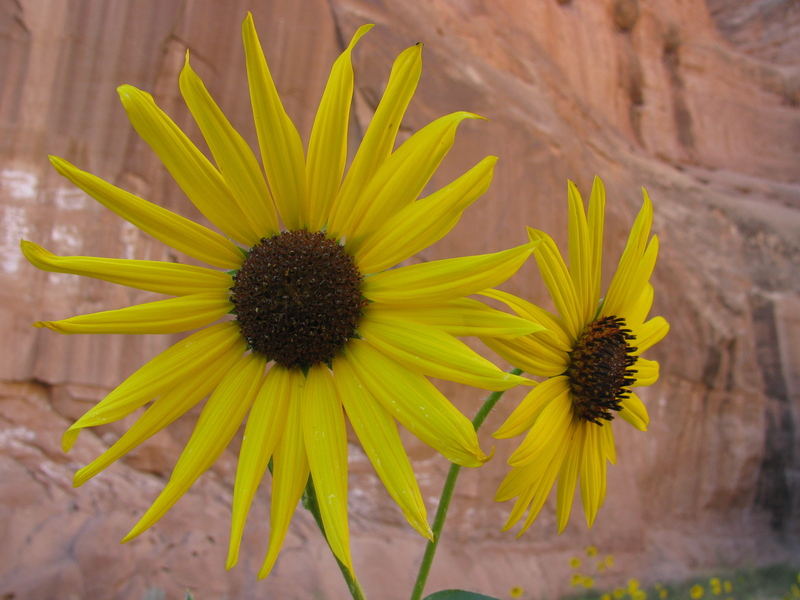 I’m headed to a new national park for me: Capitol Reef. See you in a few days. 8 a.m. — The morning light and refreshing temps around 60 made the early parts of the day easy. We’d find a tributary to this drainage system we were exploring, follow the sandy wash up as far as it would let us, and find ourselves constantly surprised by what we found. Over and under and through willows, downed junipers or cottonwoods, spider webs, rabbitbrush, flash flood debris — we walked until we were stopped by an obstacle. Perhaps it would be a massive boulder fall that blocked our path, although a few beckoned us to scramble over. A patch of quicksand with my curiosity-led footprints in it stopped us once. A vertical pour-off can halt your forward progress in a hurry if it’s not climb-able. Thickets of poison ivy, thriving in the moist wash bottom, can spell the end. 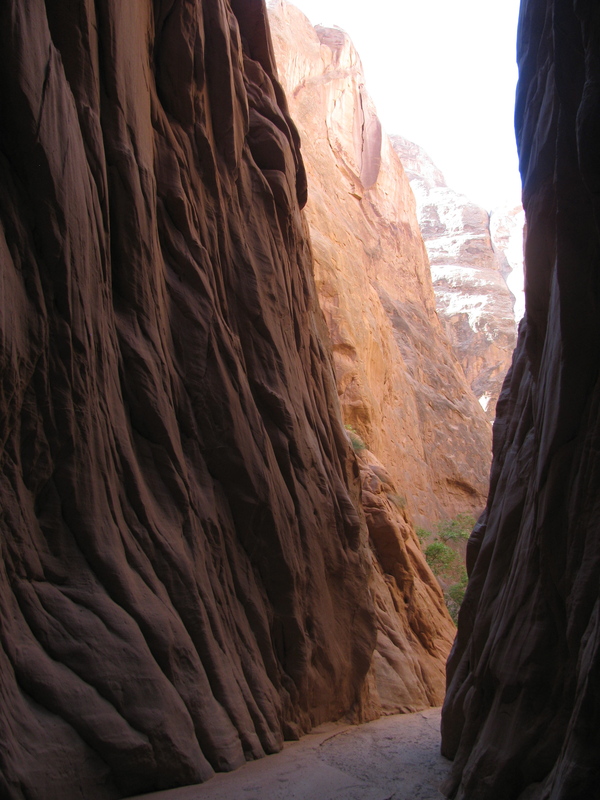 This slot canyon has very textural walls. Gorgeous. 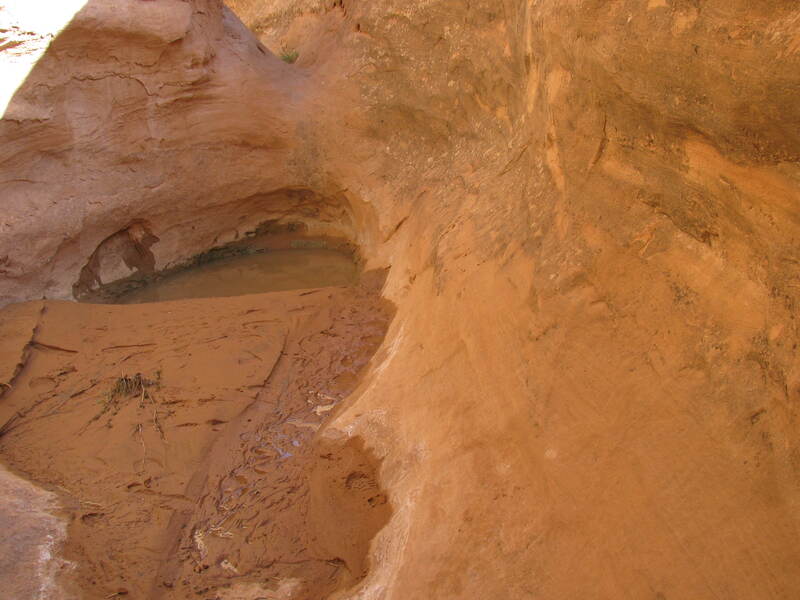 My favorite impasse, however, was the small slot canyons we found. Sandstone does fascinating things under the pressure of running water, which is possibly the most powerful force on the planet. The water will find any area of weakness and begin scouring, and grain-on-grain erosion relentlessly wears away the exposed layers. Arid regions such as Utah have little soil to absorb the rainfall, so run-off is violent and rapid. The canyons that result can be breathtaking, narrow, and dark. 6 p.m. — I was starting to get tired. All told, we roved 18 hours in two days through Lost Spring Canyon. Found several arches we didn’t know were there, and two majestic alcoves eroded over a hundred millennia. I was hoping to spy some pictographs or petroglyphs, but instead found other fascinations. 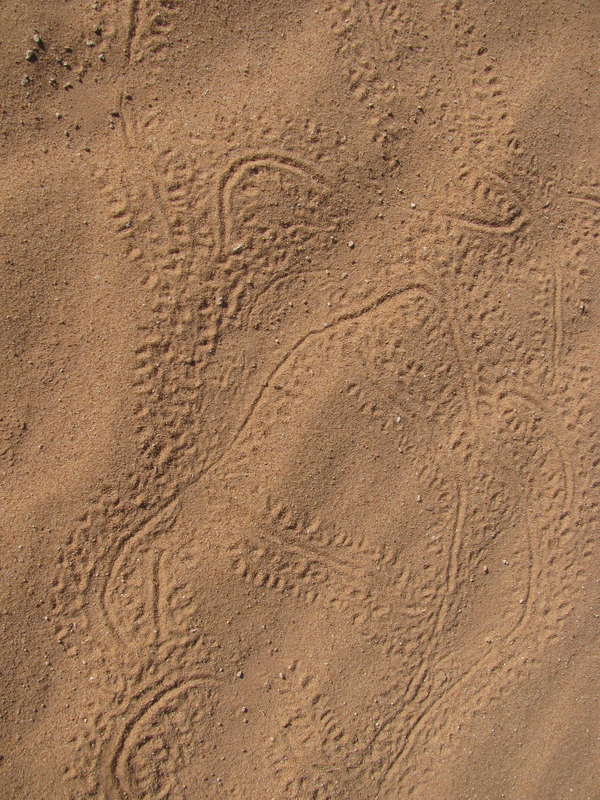 Bobcat tracks. Spring flowers re-blooming. Lizard trails. Hanging gardens. Patches of green grass, which, since I haven’t seen green grass since leaving Minnesota, compelled me to throw myself down upon it and lie there gazing upward through the cottonwood leaves tinged with yellow. No other human beings; this was a gift. I accepted it with gratitude, painfully aware of how few weeks I have remaining here. Three hundred times I have sat down at my laptop to put my thoughts, feelings, and photos out there for anyone and everyone to see. 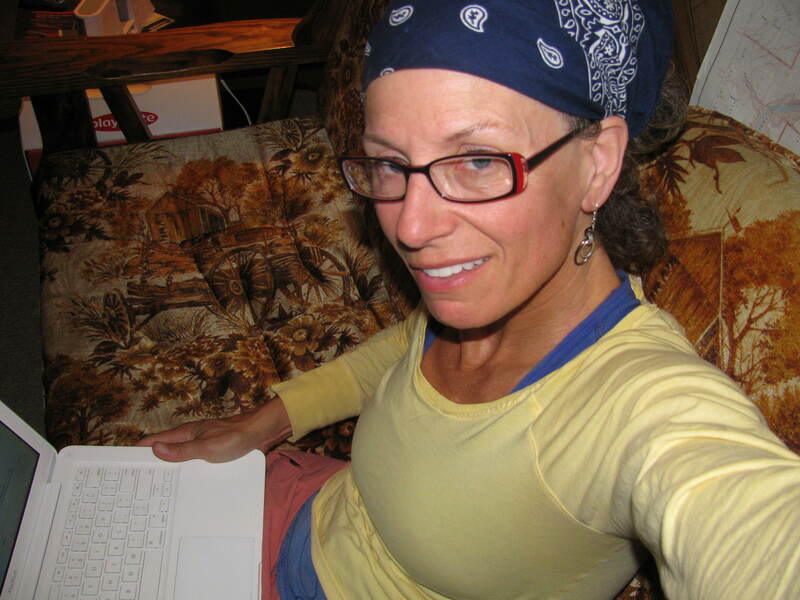 Three hundred times I have had somebody, or lots of bodies, click on my blog and read along. Yesterday it was a very healthy 92 people. Thank you, from the bottom of my heart, to each of you who checks in from time to time. A park ranger’s life can be a far cry from wherever you are and whatever you do, and some of you are living vicariously through my adventures. Here is my challenge to you: follow hard after your dreams and chase them down. If you have life circumstances that may prevent you from fully experiencing what you hope to do — so what!?! Create something that you can do, a baby step you can take, to move you toward your heart’s desire. Acquire a passport. Register for a course. Organize a community event. Take a long-postponed trip. Learn a new skill. Contact an old friend. Donate unnecessary possessions. Begin writing that novel. 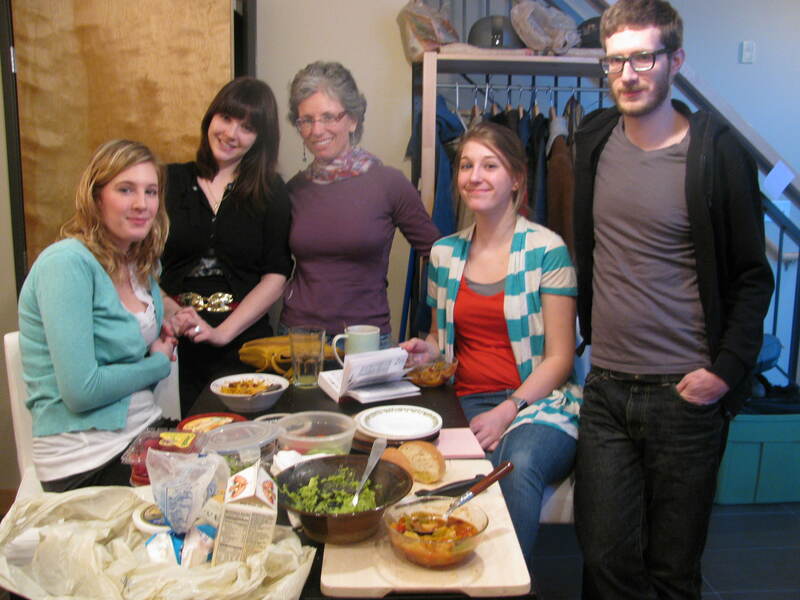 Throw a dinner party. Go back to college. Buy a small tent. Forgive an offense. Simplify your life. Study a second or third language. Find a fresh hobby. Start a blog. Restore a damaged relationship. Run for public office. Sleep under the stars. Build a tree house. Apply for a long-shot job. Stir the pot… yes, stir the pot. Risk-taking is part and parcel of being human. How will you step out of your comfort zone today? Find your courage; taste the deep satisfaction that accompanies your admirable choice. 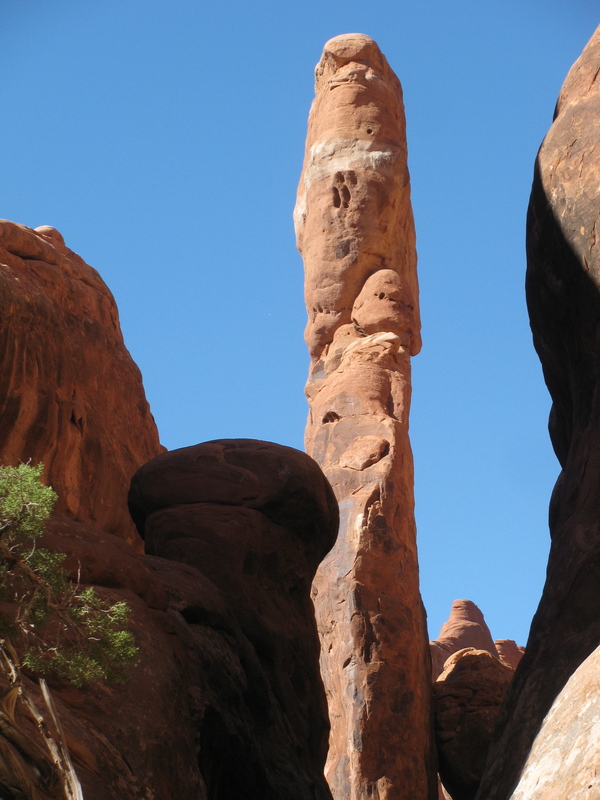 For eight hours we had hiked up and down washes in the Lost Spring Canyon area — real estate not in the original Arches NP, but added in 1998 for its scenic value. Bill was evaluating habitat for Mexican Spotted Owls, necessary before deciding on things like rock climbing management plans. We looked for roosting areas, white-washed cliff walls, owl pellets, rodent bone graveyards. 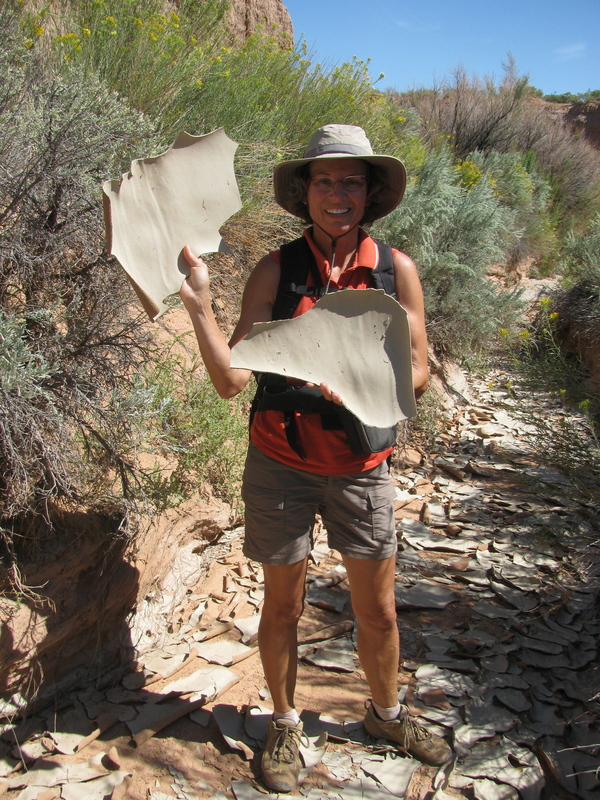 Along the way we also found lithic scatters, annoying invasive plant species, and Desert Spiny Lizards. How can the sunflowers still be blooming?!?!? The beauty of it was in hiking for an entire day and not seeing another party out there. In a national park that will likely see a million visitors this year for the first time, that is not an easy assignment. “Wilderness is not a luxury but a necessity of the human spirit,” wrote Edward Abbey. I agree. It is when I am out in the middle of nowhere that I feel most fully alive. Cliff walls, animal tracks, and visual textures invite me to use my senses and intellect to categorize and compare. Identifying lizards, plants, and rock layers exercises my mind while the hiking exercises my body. Taking scores of photographs helps me remember the places I walked, as well as challenging my eyes to see things differently. If the sun does this to mud, what is it doing to my skin? I can hear some of you thinking that you’d rather just stay in the comfort of your own home. I respect that. While wilderness wandering is not everyone’s cup of tea, I certainly am glad that visionary people forever preserved large chunks of it for us all to enjoy. Long live our national parks! I had not been back from the wilderness for even an hour this morning when the radio started to crackle. Soon I heard an ambulance racing up into the park, lights and sirens ablaze. A tour bus full of French visitors had stopped at Balanced Rock, one of our least dangerous and most innocuous locations. One unfortunate 63-year-old had stepped off the sidewalk by about fifteen feet to click a photo, and was bitten in the ankle by a rattlesnake. He was already having difficulty talking and had a pulse of 150. The local hospital couldn’t help him much, as antivenin is available only if one knows exactly which species inflicted the bite*, so he was helicoptered to Grand Junction, Colorado. I expect he’ll be in the hospital for a week or ten days and then have a long, slow convalescence. Kind of ruins his American vacation. Was it one of our shy Midget Faded Rattlesnakes? They are nocturnal, except that sometimes the males are out scouting for new territory this time of year and perhaps one was just there to get stepped on. Or, perhaps it was an atypical species of rattler (not our small shy one) that was just passing through. It makes treating the victim difficult. You don’t want to mess with our Midget Faded. Shy, yes; benign, no. Their neurotoxin is one of the most potent of rattlesnake venoms. The typical effect of a bite from a Crotalus species is similar to most viper bites with massive edema (swelling) and tissue destruction. I hope the man from France recovers fully and quickly.